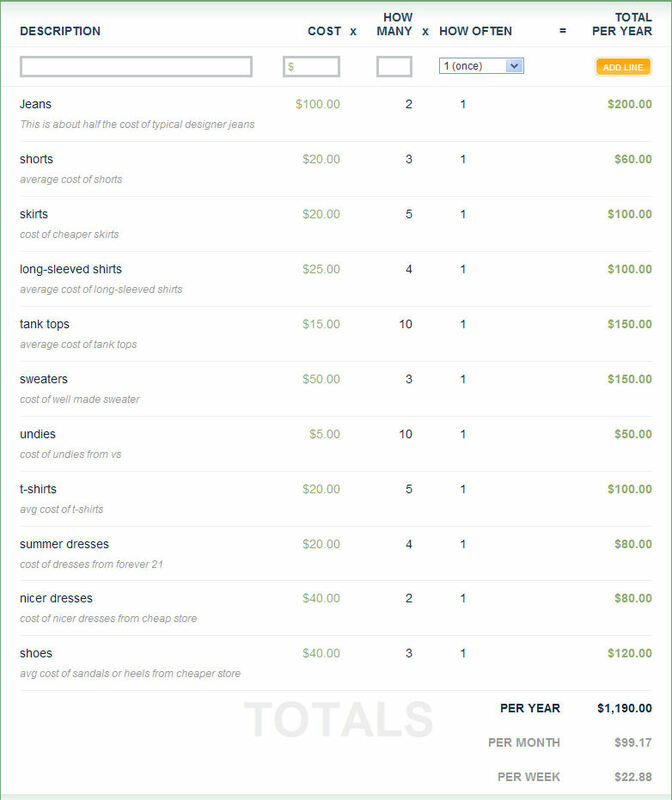 What’s your reaction to this clothing budget for an older teenage girl? Here’s one of my favorite approaches to teaching kids how to spend wisely: put them in charge of a fixed budget for a specific area of spending. For teens, my wife and I always pick clothing first. It’s a well defined area. It’s a "need" that can quickly morph into a “want”. It’s something that most teens care about a great deal. It’s prone to lots of impulsive decision making and peer pressure. It’s often an emotional friction point between teens and their parents. In other words, it’s a perfect opportunity for teaching your kids some fiscal discipline in a hands-on way. List each line item with estimates of typical price and quantity. This tends to be a real eye opener for the teen and even the parent! Revise the budget proposal until it’s appropriate. What’s appropriate? It depends upon your family’s financial situation, your family’s values, where you live, and numerous other factors. This phase invariably leads to meaningful parent-child dialog and greater common understanding. It’s a good idea to record some simple explanatory notes along with your final budget. The historical record can come in handy if (when) spending gets off track later. Establish a regular allowance that matches the overall budget. The allowance can be weekly, monthly, yearly, or whatever. We like to create an annual allowance and fund the clothing expense account all up front. This challenges our teenagers to handle a large chunk of money wisely over a long period of time. That’s a skill that takes some trial and error to master. Track the balance and step aside. Keep track of the running balance in the clothing account and, otherwise, leave the decision-making up to your teen. Well, for the most part. You’ll probably want to set a few basic ground rules up front about what’s off limits. Do what makes sense for your family. But, by all means, let them make the inevitable poor decision here and there. Let them experience the consequences. Make sure they clearly understand one hard and fast rule up front: when it’s gone, it’s gone. How do you handle purchasing clothes with your teen? How would you revise the sample budget at the top of this post? Oh thanks for sharing your budget tips and this is really helpful especially for a mom like me. Everybody should be wise when spending their money on clothes since you can buy cheap clothing on the net, on vintage shop or thrift mart. I don't agree that you need to buy those expensive items with signature and then throwing them away after 3 or 4 times of wearing it. Such a bad idea! If you were looking for best buys, check this site lnlclothing.com. This really helped us think about the whole clothing issue for our teenagers. We are willing to adopt this budget, but we will let our girls explore their options. Nice work! Thanks for sharing. Excellent - well done, and thanks for leaving your comment! 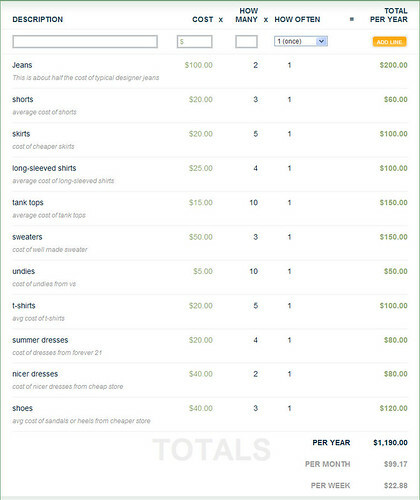 If you're a frugal shopper (and/or not too demanding style-wise), you can indeed spend very little on clothing. Personally, I spend very little because I don't care much about clothing, have no fashion sense, and wear mostly T-Shirts and jeans - i.e., classic software developer attire! Everybody is different in their requirements. The key thing is to consciously make a budget that matches your situation and stick to it. hey... i get $20 a month. I only have like $15 to spend on clothes. Im 14, is that enough? Hey commenter #7 - thanks for your question! I'm afraid I can't give you a definitive answer because it's dependent on so many factors - like your family's financial situation, your family's values, your clothing needs, how much you're expected to cover vs. your parents, etc. But, I can give you a good recipe to arrive at a reasonable answer with your parents: it's right up there in the blog post. Follow those steps of making a detailed budget and reviewing/revising it with your parents and you'll have your answer. As for my personal opinion: if you're frugal enough, content with simple clothing, and determined enough, you can make $15/mo work. Lots of people do. I have a teenager and I think $20 is way too small, ridiculous really. You can basically buy one cheap item of clothes a month. Or a cheap pair of shoes that is bad for your feet. And how can you buy coats and boots and things like that? I'll betcha anything Bill Dwight spends more than $20/month on clothes. He probably didn't want to offend your parents, Anonymous. I didn't "recommend" $20, and you can see from the post screenshots that $20 is way below our family's budget for our kids - I just said it could be made to work (in a very difficult situation). The specific advice was to work out a mutually agreed upon budget between parent and teen that makes sense for each family's unique situation - as opposed to spending randomly without planning. So, not quite sure what's causing the kerfuffle here. Feel free to suggest an alternate strategy.